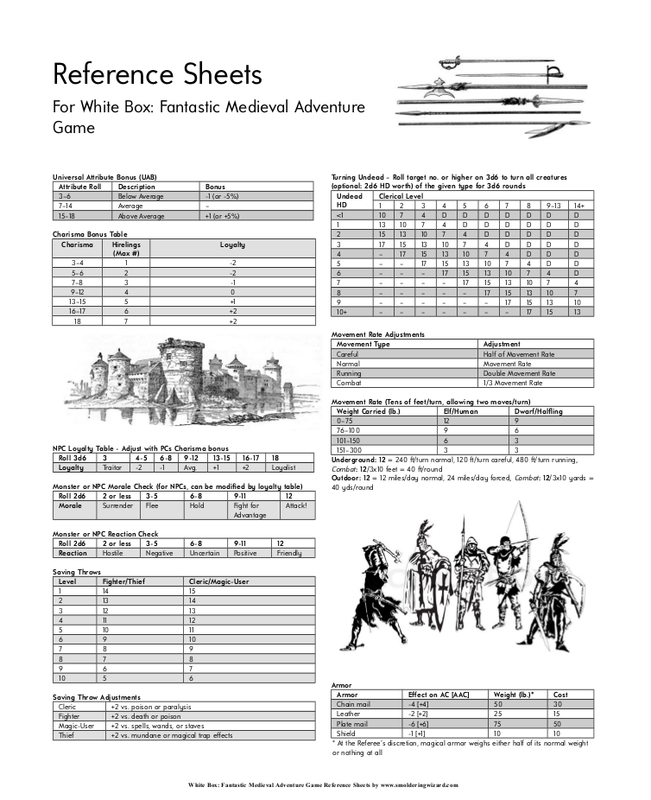 I’ve been meaning to update my S&W White Box reference sheets for a while, and finally did so with modifications to bring them in line with the latest version of White Box: Fantastic Medieval Adventure Game (the second printing). My goal was to put just the most-used information on two pages. with a bit of room left for some public-domain art. The White Box: FMAG reference sheets are available in PDF format, or click on the image below. Note that the author of White Box: FMAG, Charlie Mason, has a referee screen available in PDF format, with much nicer art and a few more pages of information (suitable for making your own referee screen). However, the undead turning table in the official referee screen has not yet been updated to the latest rules version.